Sport can be relatively inexpensive, but there is no escaping the fact participation can also be costly. An LSE study found cost is the biggest barrier to young people’s participation in sport, which is why it is essential that sporting governing bodies and organisations make every effort to make sport as affordable and as accessible as possible. Swim England has launched the Just Swim scheme, a free membership initiative designed to help seasoned and new swimmers alike. The Just Swim scheme is the first of its kind to be aimed at non-club swimmers, and provides access to a host of benefits. 11 million adults in the UK swim regularly, but it is hoped free membership will attract many more new to swimming – and the scheme provides something for everyone. Members will be offered expert tips on how to improve their swimming, alongside other benefits including exclusive discounts from Swim England partners, access to British Swimming and Swim England ticket offers, access to challenge events discounts, access to local pool offers as well as swimming tips and advice. There’s also a free Just Swim app – a user-friendly goal-setting and swim logging app that helps you burn off calories and get a little bit fitter at a pace that suits you. It’s very easy to user and there are no complicated training plans, simply swim your way towards getting that bit fitter. You can download the Just Swim app here. As well as the app, the Just Swim website provides tons of swim-related advice, including pool-based exercise routines, healthy eating tips and loads more stuff to help you maximise your swimming experience. The more schemes and initiatives that make sport accessible, the better. You can sign up for free Just Swim membership here. KUDOS passionately supports and encourages people from all backgrounds to get into swimming. 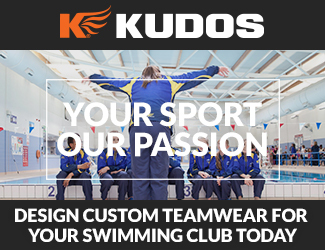 KUDOS custom-made swimming kits are designed to cope with the rigours of the sport, in matching styles across all garments – including swimming team tracksuits, swimming kit, team hoodies and more.